One of my photography goals has been to photograph a male Wood Duck and to ideally photograph it in a natural setting and with sufficient light to produce a good image. As you can see by the two images in this article, I achieved that goal in December while in Florida, and I am still excited about it! 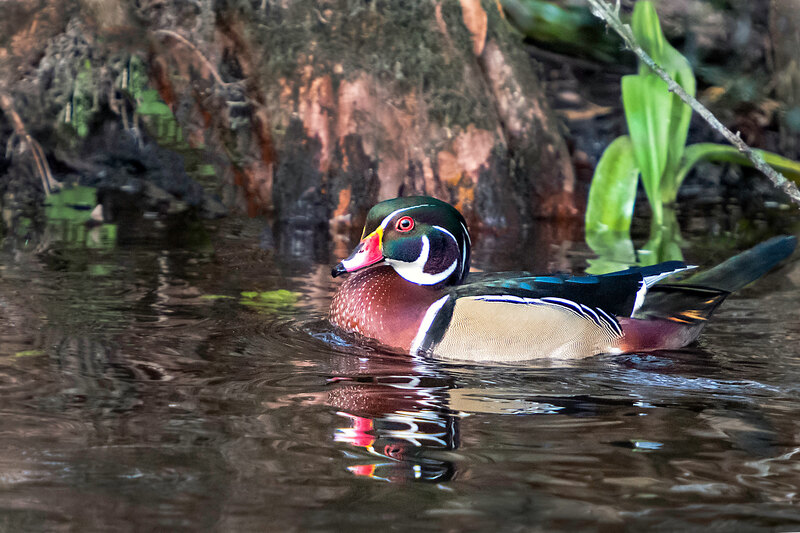 The male Wood Duck is one of North America’s most colorful waterfowl with its distinctive multicolored iridescent plumage and red eyes; so you can see why it was high on my photography goal list. Although my two images are very good (in my opinion), I would have liked to have had more time and better circumstances to capture the duck’s image, as well as an image of the male’s mate. The female was also on the river. They are usually seen in pairs, but the female was ahead of the male, and when they saw the boat that I was in, they quickly swam out of sight. I was very lucky to get these images because I was on a crowded (full capacity) boat used by the State of Florida at the Edward Ball Wakulla Springs State Park to provide tours of the Wakulla River. The boat included many children, and they and their parents got very excited when an alligator or manatee was spotted, which happened frequently. The children and a few adults ran around the boat from front to back and side to side, depending on where the gator or manatee was located. There was shoving, shouting, screaming, pointing, waving, and point and shoot camera flashes. It was chaotic at times, not the way I enjoy nature photography. I was on the boat because a friend emailed me on my way to Carrabelle, Florida, which is on the Gulf Coast, to visit another friend. Her email said that she was at Wakulla Springs the day before, and she had seen some Wood Ducks. The timing was perfect, since I was only about 10 miles from Wakulla Springs; so I immediately changed directions. I called my friend from Carrabelle, and we met at Wakulla Springs State Park and took the boat tour with high hopes of seeing the Wood Ducks. I had never been on these tour boats and did not know what to expect. I would have preferred to be on a kayak or canoe, alone and quiet, but the tour boat was the only option. After buying the boat tickets, we had to wait about an hour before the boat returned and we were able to board it. We waited, second in line, to be able to select the best seat possible to get a shot if we were lucky enough to see a Wood Duck. I chose the starboard side, since it would be facing the river’s shoreline, where the ducks most likely would be located. It was not until the last section of the river, as the boat approached the spring head, that I spotted a pair of Wood Ducks tucked in close to the shoreline behind and under various tree and plant growth. At the same time, the people on the boat were scrambling in all directions because someone shouted that they saw a large alligator and a manatee. Eventually, some spotted the Wood Ducks too, but the boat kept moving and the ducks were hustling to get out of sight. Wood Ducks are very skittish to include those that frequently see people. They often take flight as soon as they see people, who are perceived to be a threat, and rightfully so, because Wood Ducks are hunted in the United States and Canada. It is beyond my comprehension why anyone would harm such an incredibly beautiful bird. 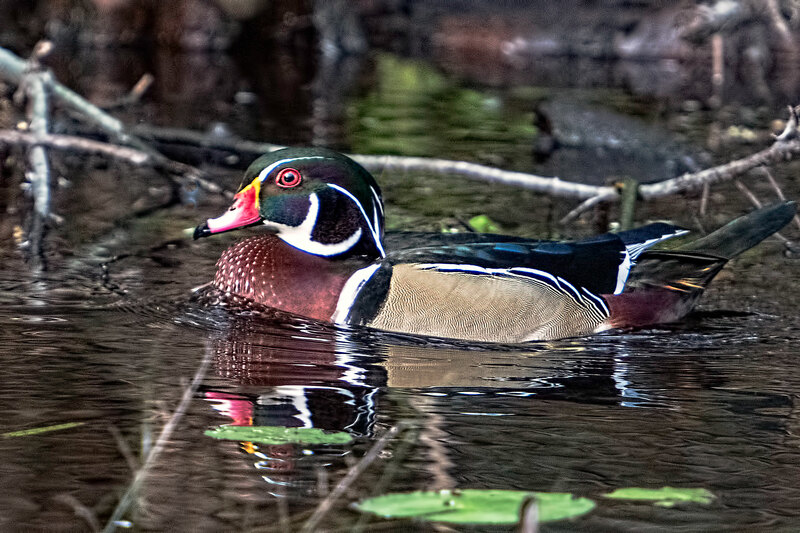 Prior to going to Carrabelle, I tried a few times to photograph Wood Ducks that had been seen on Prairie Creek Preserve in Gainesville, but as soon as the ducks saw me approaching, they flew quickly away. They were impossible to photograph. Due to those “near misses” and the chaos on the boat, you can understand why these images are special and cherished. I photographed the Wood Duck after knocking several children to the ground and elbowing myself and camera in between people–just kidding, but I did feel a bit like George Constanza on the Seinfeld episode with the clown and fire at a children’s birthday party. The images were captured using my Nikon D800 with a 70-200 f2.8 lens and TC20 teleconverter. This entry was posted in Bird Photographs, Nature, Wildlife and tagged Wood Duck. Bookmark the permalink. Incredible, Stephen! When I clicked on the photo, I was amazed at the clarity and beautiful colors. Congratulations on so competently accomplishing one of your photography goals! Lovely!!! are you sure its real! Great to hear from you Donnie. I read your Wood Duck blog article and cannot agree more that Wood Ducks are difficult to photograph. The key is to keep trying, like you said. Congratulations on finding this beautiful bird in the wild and succeeding in filming him under such harsh conditions! He’s gorgeous, beautiful detail; thumb’s up to you, Steve! Thank you for the congratulations and comments. I hope to see and photograph more Wood Ducks and get even better images, and hopefully under less difficult circumstances. Your commentary on how you were able to “capture” these images is too funny! The photos are gorgeous but it was your dialogue that made me laugh aloud that I enjoyed even more!!! Thank you Anne. To get the shot, I have struggled with bad weather; slippery trails; crawled along cliffs; trespassed; hung out of a flying helicopter and airplane; stood in streams, creeks, rivers, and mud; but dealing with a rowdy crowd of kids was the most difficult. It was a challenge, but one must do what one must do to get the shot.